Bell & Ross‘ top of the line wristwatch is its skeleton tourbillon chronograph, which just got fancier and a lot more expensive with the BR-X1 Chronograph Tourbillon Sapphire. The watch case is entirely sapphire crystal, comprised of nine parts: case middle, back, bezel, crystal and four bumpers for the sides, all held together by vertical and lateral screws. Sapphire crystal in watchmaking is synthetic corundum grown in laboratories that is usually cut into flat discs for the watch crystal. Though Alain Silberstein pioneered sapphire watch cases in the 1990s, the material has recently become fashionable once again for watch cases. Bell & Ross is the latest, after Richard Mille, H. Moser & Cie., Hublot and Greubel Forsey, just to name a few, to jump on the sapphire crystal bandwagon. The sapphire case measures 45mm in diameter and is matched with a translucent rubber strap inlaid with metallic finish woven Kevlar. 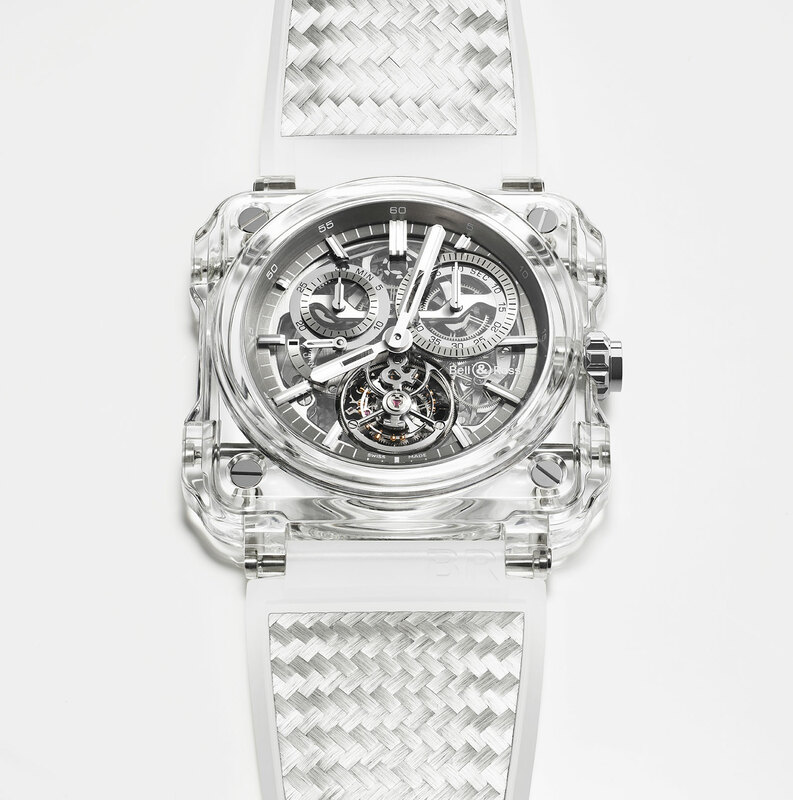 While the aesthetics of the clear watch case are novel, the mechanics inside are the same. Hand-wound with a four day power reserve, the BR-CAL.285 has been used in other models, included the recent, wood-clad Instrument de Marine. 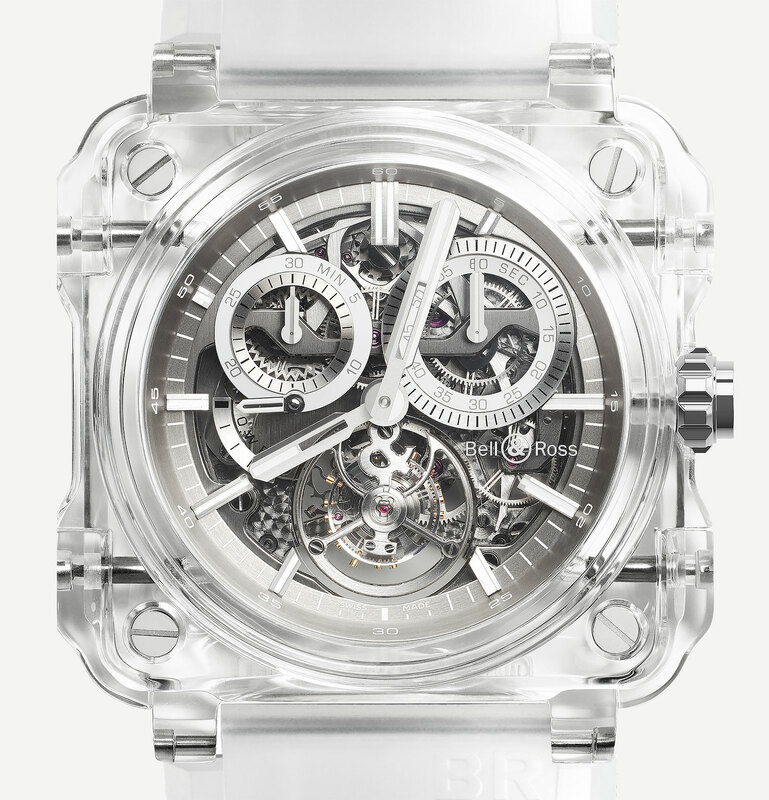 It’s a single-button chronograph with a flying tourbillon regulator, as well as open-worked bridges and base plate. The movement is almost a decade old, having been first conceived by BNB Concept, the defunct complications specialist that was taken over by Hublot in 2010. Now the calibre is produced by MHC Manufacture Haute Complication, a complications builder founded by an alumnus of BNB Concept. 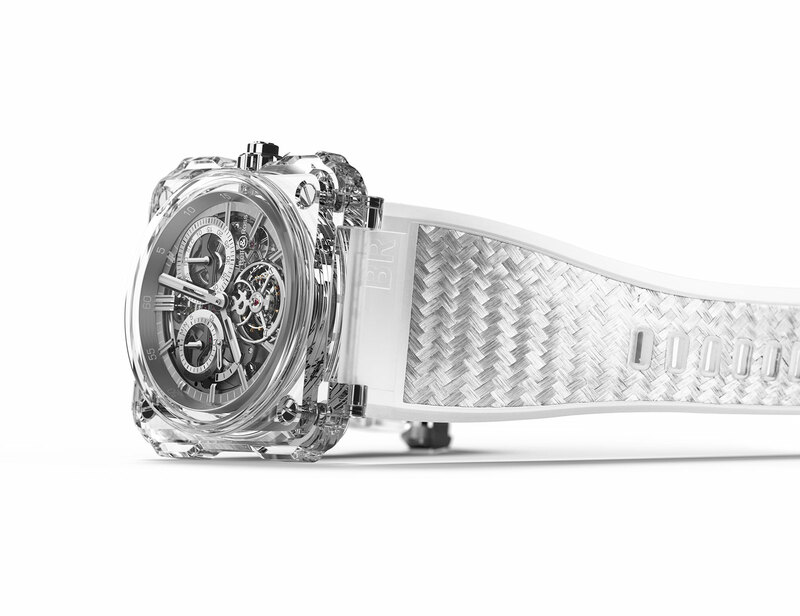 The BR-X1 Chronograph Tourbillon Sapphire (ref. BRX1-CHTB-SAPHIR) is limited to five piece with a price of US$495,000.